In this Hong Kong Travel Guide for Food Lovers you’ll find personal tips and recommendations about where to stay, things to do, and details about some of the best food to eat in Hong Kong. Home to one of the world’s most spectacular skylines with a natural harbor and lush green mountains, Hong Kong is a densely packed city where you’ll discover fresh wet markets slotted between skyscrapers and delicious food nearly everywhere you look. From sightseeing to shopping to eating, Hong Kong offers you a full sensory travel experience. Let’s jump right into this Hong Kong food and travel guide! Click here to buy on Amazon Kindle. Click here to download free PDF (right now it’s free for a limited time, so download now!). However, if you’ve benefitted from this guide, please consider making a quick donation (it costs $4.99 on Amazon). 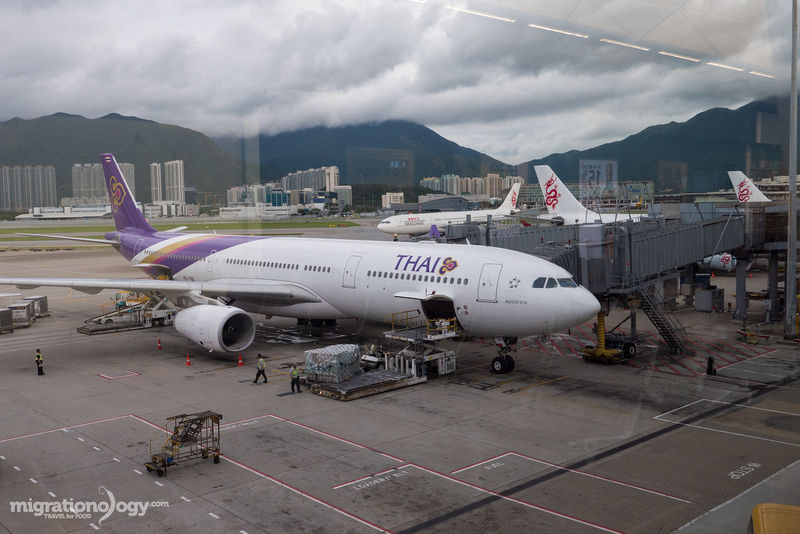 Hong Kong International Airport (HKIA) is the main airport gateway to Hong Kong, and one of the busiest airports in the world in terms of both passengers and cargo. The airport is modern and clean, relatively spacious with a number of different terminals, and I think they’ve done a pretty good job (similar to Seoul Incheon) in handling passengers efficiently (although there can be long lines at times). 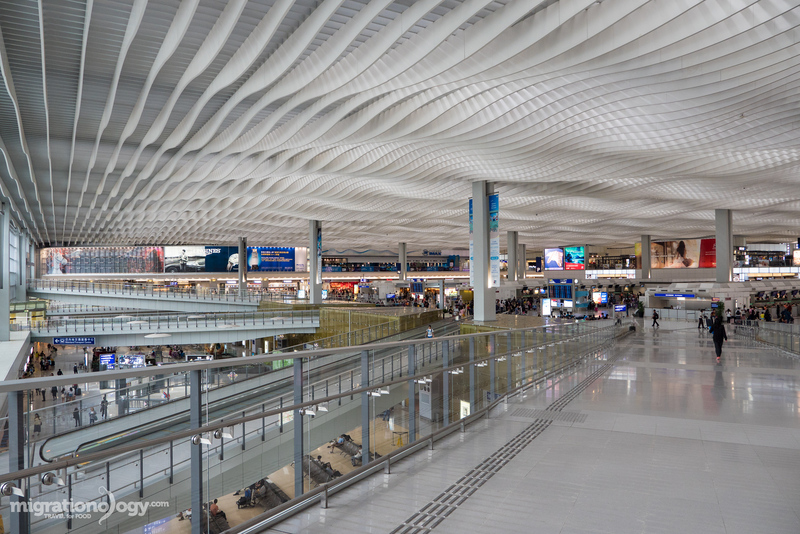 HKIA is located on its own island about 34 km from the center of Hong Kong island, and depending on the mode of transportation you take and the destination you’re going in Hong Kong, it can take around 30 mins to 1 hour to get to the center of the city. When you have your hotel or destination in Hong Kong ready, then you can decide the best way to get from the airport to Hong Kong. In all cases, it’s relative easy and straight forward and the great thing about Hong Kong is that signs are always written in English. Here are a few options you have for transportation. MTR Airport Express: The fastest and one of the easiest ways to get from the airpot to Hong Kong is by taking the MTR airport express. After getting your luggage, follow the signs for the Airport Express, and they have vending machines where you can buy your ticket. You have a number of options, but a single journey ticket to Hong Kong Central station costs 100 HKD. Bus: The bus system in Hong Kong is extensive and covers just about everywhere (see transportation section below). Here’s a guide to taking the airport bus. Private taxi: On my latest trip to Hong Kong, when we arrived from New York City and my wife wasn’t feeling very good. So we decided to jump into a taxi and head straight to our hotel. 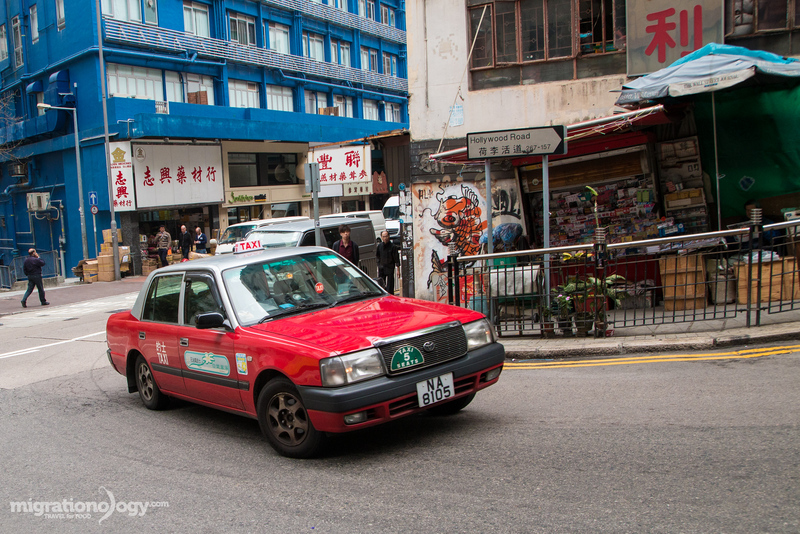 Just head outside from the arrivals terminal, and you’ll find an official taxi line where you will be directed to the next red and white classic Hong Kong taxi. The ride, depending on traffic, can take 30 mins to 1 hour, and we took a taxi directly to the center of Hong Kong Island (Admiralty) and our total price came to 330 HKD ($42.55). Taking a private taxi can definitely be worth it if you’re with 2 – 4 people and have luggage. Unlike the mainland of the People’s Republic of China, the Government of Hong Kong offers a pretty liberal visa policy for many countries around the world. You will need to do your own individual research depending on what country you’re from, but there’s a pretty extensive list of countries that are able to get 90 days on arrival for free (or 30 or 14 days for free) without applying for a Hong Kong visa. Wikipedia has a very complete guide about Hong Kong visas. I’m a US citizen, and so long as your passport is valid for over one month after date of intended stay, you simply land in Hong Kong and get stamped in at immigration for 90 days. I’ve been to Hong Kong three or four times and never had any issues. Just like in all my travel guides for food lovers, I like to break down the accommodation in a city by the area or neighborhood. Along with the actual hotel itself and your requirements, staying in a good location when you travel to any city is very important. Hotel prices in Hong Kong can be very high, similar to London or New York City, but at the same time you’ll also find some decent budget options if you search around. For this accommodation section in this Hong Kong travel guide I’ve listed a few areas that I would recommend along with hotel suggestions for each of the areas. Located on Hong Kong Island, around Hong Kong station to Sheung Wan and Admiralty, this is the center of Hong Kong commerce and business. If you want to be on Hong Kong Island, in the middle of it all, this is the best area to find a hotel. There are limitless options for food, shopping, and wandering. 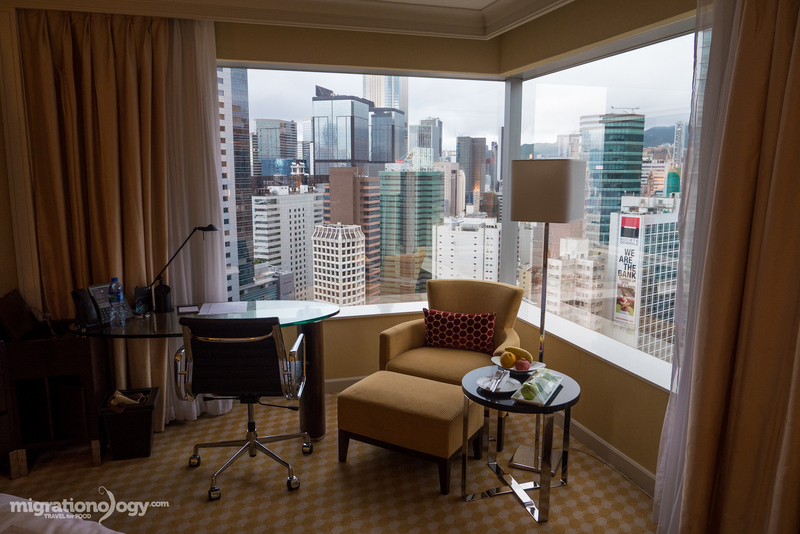 For a luxury option, on our latest trip to Hong Kong my wife and I were sponsored to stay at JW Marriott Hotel Hong Kong, and we had an amazing stay. There aren’t many budget options around Hong Kong Central, but there are some mid-ranged hotels like 338 Apartment. To still be on Hong Kong Island, but a little further away from the main central banking district of Hong Kong Central and in an area of Hong Kong that has a little more of a neighborhood feel to it, Causeway Bay is a fantastic area for you to stay. I love the restaurants and eating options around Causeway Bay and the local markets. There’s a mix of accommodation available, especially mid-range hotels like Holiday Inn Express. On one of my previous visits to Hong Kong I stayed at Rosedale Hotel, which was a decent hotel, in a great location. One of the most popular areas of Hong Kong to stay in, offering the widest selection of hotel and hostel options is Tsim Sha Tsui, located on the Kowloon side of Hong Kong. This crowded area of Hong Kong is home to shopping malls and markets, restaurants galore, tourist attractions, and good access to public transportation. In Tsim Sha Tsui you’ll find loads of five star hotels like the legendary The Peninsula Hong Kong and mid-ranged hotels like The Salisbury YMCA of Hong Kong if you can get a reservation. For budget, there are plenty of options, most notably in the Chungking Mansions, where you can get a small single room or dorm bed, plus an experience at hostels like Comfort Guest House E.
I’ll just say that Mong Kok wouldn’t be my first choice area to stay in Hong Kong, but if you’re looking for budget hotel and hostels and want to be surrounded by entertainment and shopping, Mong Kok could be a good option. There are plenty of affordable and bare-bones (yet clean) hostels and guest houses like Gold Keep Hostel and Kam Fu Guest House. On my most recent trip to Hong Kong, my wife and I were on a Round The World Trip with Star Alliance and Marriott, so we had a sponsored stay at JW Marriott Hotel Hong Kong. The hotel is luxurious, with great service, and it’s in a superb location within Pacific Place with direct access to Admiralty MTR station. Highly recommended for a luxury hotel option on Hong Kong Island. Here are a few of the things I brought with me on my most recent trip to Hong Kong. For more details, check out my exact travel packing list and you can see my camera gear and electronics on my resources page. In a city that’s world famous for finance and its shipping industry, food is the backbone and obsession of many Hong Kong residents. Located in a strategic position on an island off the coast of mainland China, and with a unique history of foreign and colonial influence, Hong Kong’s food scene is diverse and always exciting. Here are a couple things I’d like to point out about food in Hong Kong (and just to let you know, these are not scholarly researched points, but just my personal observations from eating in Hong Kong). 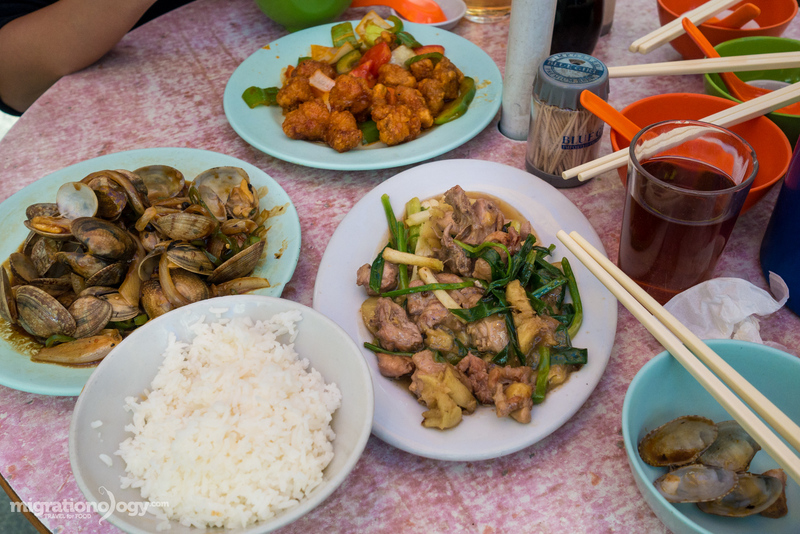 Cantonese Chinese: The majority of Hong Kong food is Cantonese in flavor and cooking style, which is one of the eight culinary traditions of Chinese food. Rice is the staple, but noodles, both in soup and fried, are also very common. Dishes make use of a huge variety of ingredients, and seasoning sauces include oyster sauce, soy sauce, vinegar, black bean sauce, sweet and sour sauce, and hoisin sauce. In addition to Cantonese food, you’ll find restaurants serving Teochew, Hakka, Hokkien, Shanghainese, and a variety of other regional Chinese food variations. 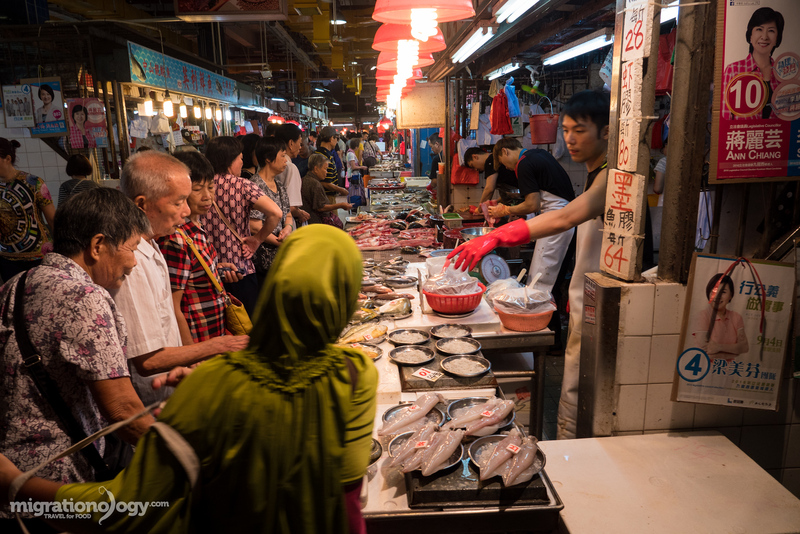 Geographical location: Surrounded by water and with access to the South China Sea, it’s no surprise that seafood is very common in Hong Kong. Especially if you take a day trip outside of the city, to Lantau Island or smaller coastal villages, you’ll be able to see first hand how the sea is such an integral part of the traditional Hong Kong culture. 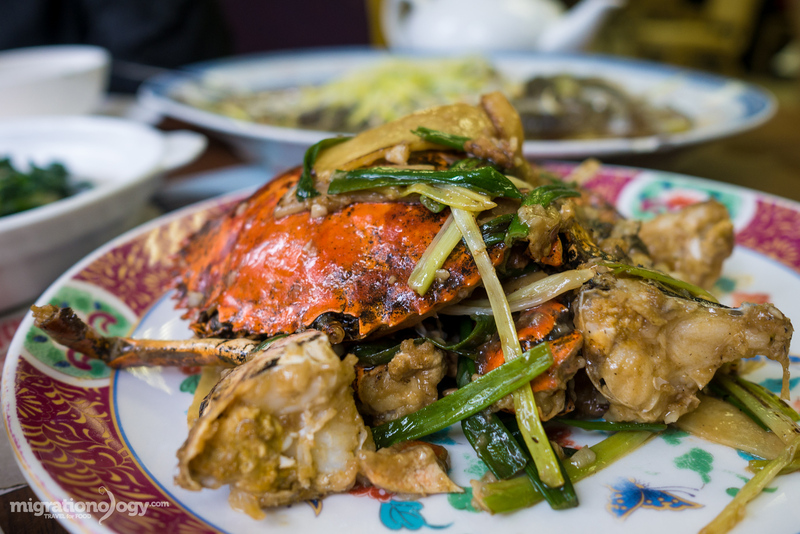 What that means for you and I is that if you go to any Cantonese restaurant in Hong Kong, you’ll find plenty of seafood dishes on their menu. Western / British influence: You might find it strange to show up to a Hong Kong street food stall and see French toast on the menu. But due to the Western influence in Hong Kong most notably the British colonial rule, things like French toast and egg tarts are popular and very Hong Kong style. 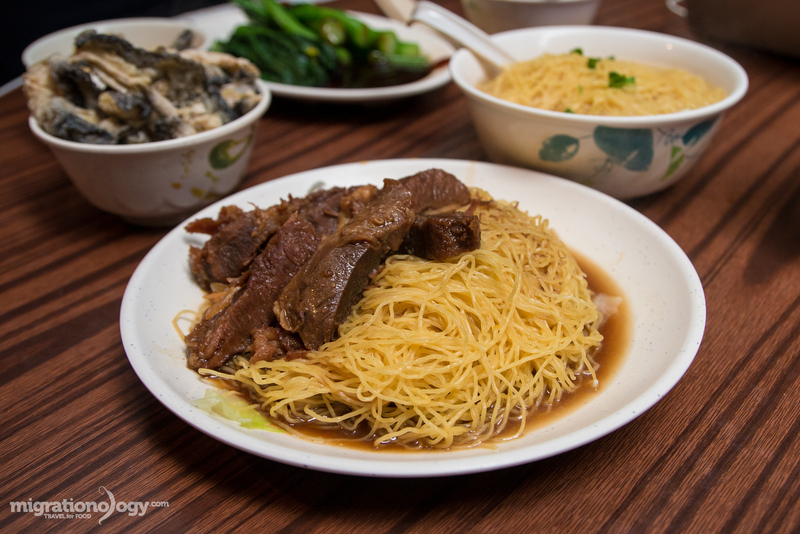 There are plenty of Hong Kong dishes that have a noticeable western influence to them, yet have been perfectly adapted into the local cuisine. Elegance and gourmet: According to Wikipedia, the 1960’s – 1980’s were a time of prosperity in Hong Kong which lead to an increase in international cuisine and ingredients making their way into Hong Kong and its cuisine. Hong Kong, being one of the richest economies in the world with a high standard of living, is a gourmet fine dining hub of the world. You’ll find world class restaurants in Hong Kong serving every type of food imaginable. In this Hong Kong Travel Guide for Food Lovers I’m going to share with you some Hong Kong street food tips and dishes to eat, but if you’re looking for a full list of amazing restaurants, I’ve included them in a separate Hong Kong food guide. Literally translated to a “restaurant with a big license plate,” a dai pai dong is at the core of Hong Kong street food eating. 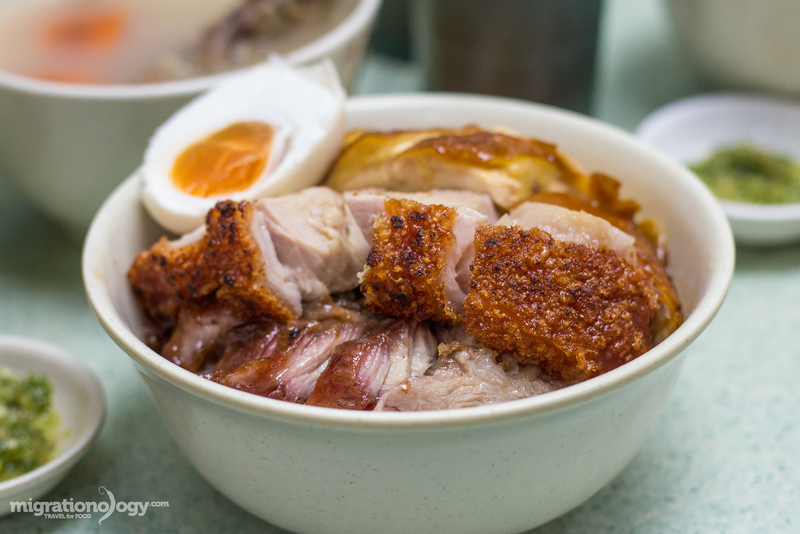 Situated on the streets and slotted within narrow alleys, dai pai dongs are street food stalls where you’ll find made to order Cantonese dishes, bowls of pork chop instant noodles, and milk tea with Hong Kong French toast. Unfortunately, the sad thing about dai pai dongs is that with the modernization of Hong Kong, the government no longer issues new licenses for these special street food stalls. The last remaining food stalls can only be passed down in the family, and when a generation doesn’t want to take-over, they simply disappear from the food scene. As a street food lover, I absolutely love both the food and especially the dining ambiance of eating at a dai pai dong in Hong Kong. 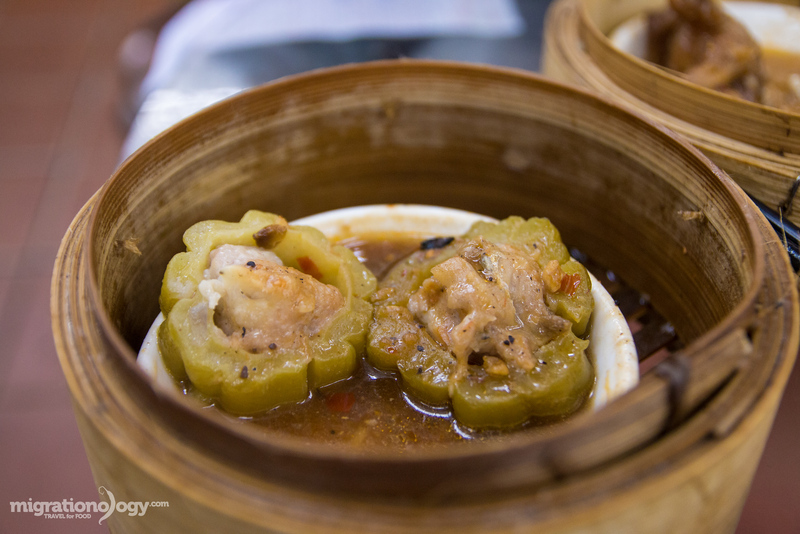 If you travel to Hong Kong soon, don’t miss the special experience of eating at a dai pai dong. Listed below are 10 of the best restaurants in Hong Kong that I’ve personally eaten at and loved for the combination of delicious food and local Hong Kong ambiance. 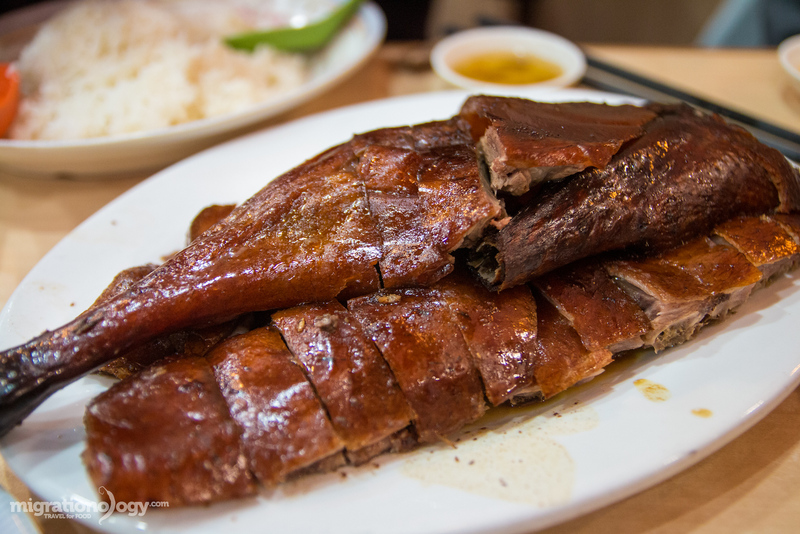 Be sure to also check out my full list of 25 dishes to eat in Hong Kong for lots more specific food and restaurants information in Hong Kong. Keep in mind, these are just my personal favorites, not a definite list of best restaurants in Hong Kong. If there’s one restaurant in Hong Kong to go for dim sum, Lin Heung Teahouse (蓮香樓) should be high up on your list. You definitely don’t want to eat here for the service, but instead it’s the lack of it, that makes it such an experience. Even for the dim sum, I’ve had better (it is good though), but it’s the old fashioned, always busy, in your face, pushcart dim sum, that keeps me coming back every time I’m in Hong Kong. 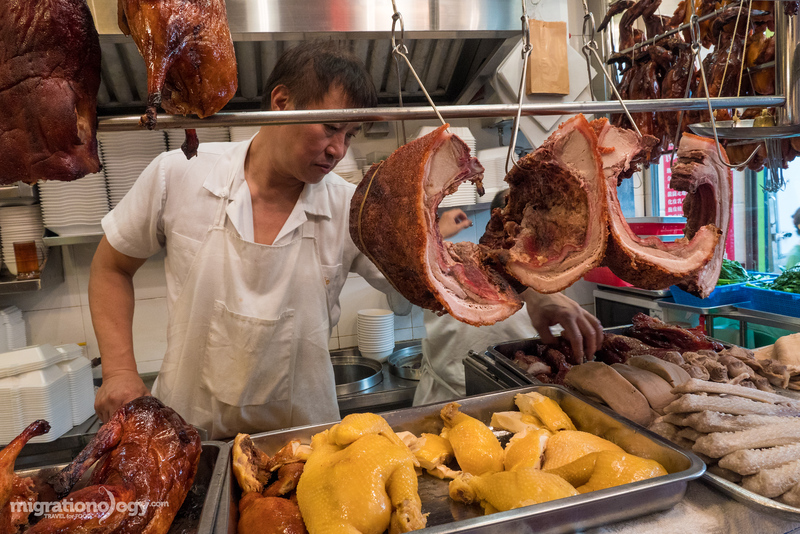 Yat Lok (一樂燒鵝) is one of the legendary restaurants in Hong Kong for roast goose. They marinate the goose in over 20 spices and herbs, roast it using charcoal, and the result is one of the most delicious things in the world. After reading about Wing Kee Restaurant (榮記(東成)飯店) at Bowrington Road Food Centre on the Stripped Pixel blog, I knew I needed to eat here. 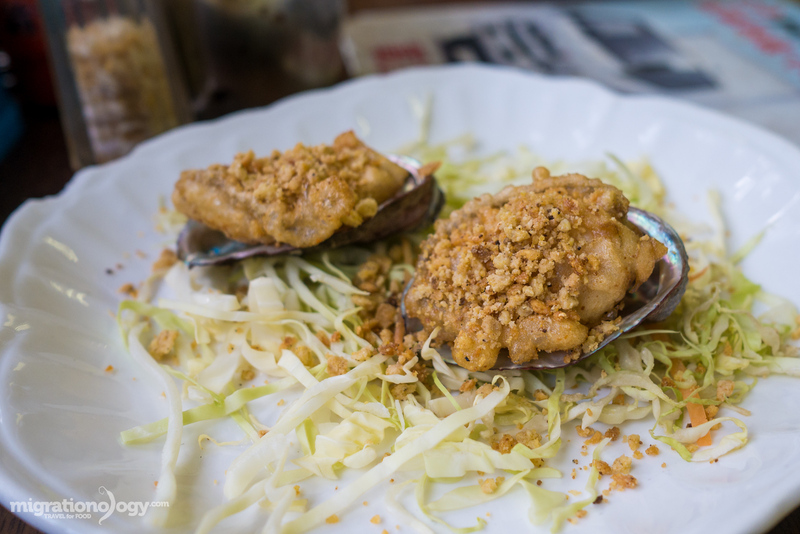 It’s a classic Hong Kong food dai pai dong environment, and the food is salty and oily, and absolutely delicious. Their roasted chicken is superb. Cantonese are experts are roasting meats and at Yau Wun Roast Meat (有運燒味飯店), located at Quarry Bay, they have an unbelievable selection of roast pork, chicken, char siu, and an incredible ginger scallion sauce to go with it. One of my favorite Hong Kong dai pai dongs for tea and snacks (and I will admit their instant noodles and fried pork is pretty tasty too) is Bing Kee (炳記). It’s a classic street food stall in Hong Kong and the service is friendly. 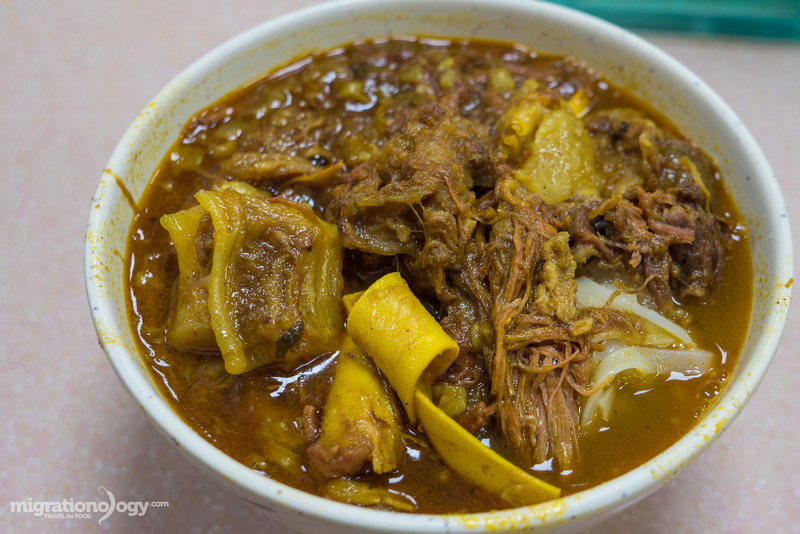 There’s no restaurant more famous for brisket in Hong Kong than Kau Kee Restaurant (九記牛腩), and their brisket with tendon curry over noodles is well worth waiting in line to eat. Located deep in Wo Che estate, Chan Kun Kee (陳根記) is a fantastic Hong Kong neighborhood dai pai dong. Again, thanks to Stripped Pixel, I took a food mission to this restaurant and it was worth the journey. All the food was good, but their drunken chicken is exceptional. Slotted between high rise buildings right at Hong Kong Central, Sing Kee (盛記) is a Hong Kong street food stall where you can order all sorts of stir fried dishes made to order and get a real taste of a flaming wok. I love the food and the atmosphere here. Located on the second floor of the Java Road wet market, Tung Po Restaurant (東寶小館) is the loud and busy Hong Kong dining experience you want – but with pretty good service. They have all sorts of Cantonese and even Thai food on their menu. There’s plenty of seafood available in Hong Kong, but the restaurant at Aberdeen Fish Market is a place to go if you’re looking for a fresh seafood feast. Ying and I ordered a seafood set meal that included abalone, crab, fish, and scallops. It was a meal in Hong Kong I’ll never forget. One of the things I love most about Hong Kong is that even though it’s a huge densely packed concrete jungle, it’s surrounded by lush mountains and forests. 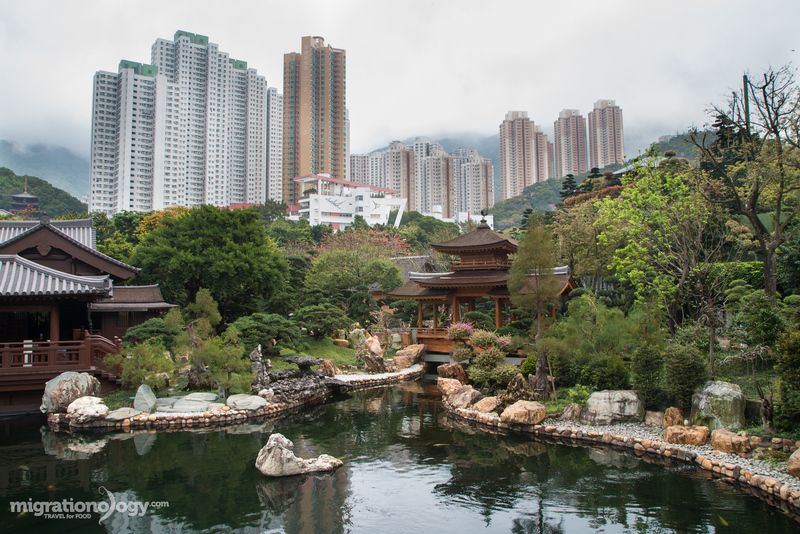 So when it comes to attractions in Hong Kong, you’ll find things to do that are within the city like shopping and visiting temples, but there are also incredible hikes and nature activities right within or next to the city. Here’s a list of a few of the top things to do in Hong Kong, aside from all the eating! At a height of 552 m, Victoria Peak is one of the main mountains that the skyline of Hong Kong Island backs into, and it’s the place for one of the most iconic and photographed views of Hong Kong. For that reason it’s a bit of an extreme tourist attraction, but at the same time it’s well worth visiting when you’re in Hong Kong. There are two ways you can get to the top of Victoria Peak, by taking the classic Peak Tram, which costs 45 HKD per person (return trip ticket) and you may have to wait in line for a while, or to get some exercise and hike. I like the hiking option, which takes about 45 mins – 1 hour depending on your level of fitness, and you can burn off some of that dim sum while you’re at it. Address: The Peak Tram station is located on Garden Road in Hong Kong Central; Opening hours: 7 am – 12 midnight daily; Entrance price: 45 HKD for a round-trip tram ticket, free to walk. Located on Hollywood Road, Man Mo temple was built in 1847, and is an example of architectural tradition in the midst of being surrounded by sky-rise buildings. You can walk around the outside and also go inside to see the giant coils of incense that continually burn. It’s not a huge temple, but a good place to stop by if you’re in the Sheung Wan area of Hong Kong. Address: 124-126 Hollywood Road, Sheung Wan, Hong Kong Island; Opening hours: 8 am – 6 pm daily; Entrance price: free to enter. Located on the Kowloon Peninsula side of Hong Kong, mention the name Mong Kok and shopping is immediately what comes to mind. If you love shopping, entertainment, and people watching, exploring Mong Kok is one of the best things to do in Hong Kong. 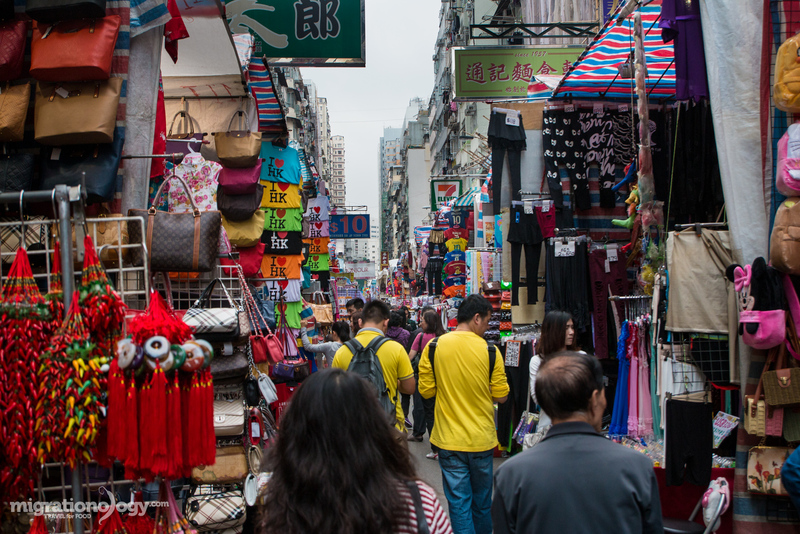 The Ladies Market, an outdoor pedestrian shopping lane within Mong Kok is one of the most well known tourist shopping markets. You’ll find everything in Mong Kok from clothes to souvenirs to electronics, and plenty of restaurants and cafes when you need a break. Address: Ladies Market – Tung Choi Street, Mong Kok, Kowloon, for Mong Kok take the MTR to Mong Kok station; Opening hours: Around 11 am – 11:30 pm daily, all businesses have their own hours. Located along Temple Street, just after it turns dark, a street full of vendors selling all sorts of random things, including knockoff gadgets, clothes, antiques, souvenirs, and even some services like massages and calligraphy, sets up along Temple Street. While Mong Kok is busy non-stop action, Temple Street Night Market has a certain calmness to it, like walking through an eerie canyon of buildings with stalls set up on both sides. It’s a nice market to walk around at night in Hong Kong, and you’ll find lots of street food style restaurants, including some famous places to eat clay pot rice (I ate at Four Seasons Clay Pot). Address: Temple Street, Yau Ma Tei, Kowloon – You can get there by going to MTR Yau Ma Tei station; Opening hours: Around 7 pm – 11 pm nightly. 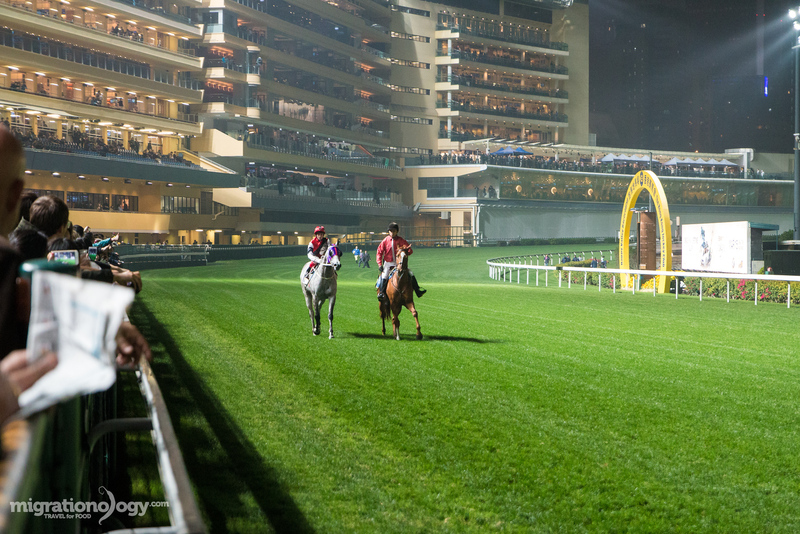 One of the things I really enjoy doing when I’m in Hong Kong is going to the Happy Valley Racecourse on Wednesday night to see jockeys race their horses against the backdrop of the lights of Hong Kong. Many people, both locals and expats go to hang out, have some food and drinks, make a couple bets on horses for fun, and enjoy the atmosphere as the exciting races unfold. It’s a cheap and fun attraction in Hong Kong at night. Horse racing season goes from September to July and usually races are held every Wednesday night, and sometimes on the weekends. Address: The Hong Kong Jockey Club Happy Valley Racecourse, Wong Nai Chung Rd, Happy Valley, Hong Kong; Opening hours: Races are typically held on Wednesday night during season and begin at 7:30 pm; Entrance price: 10 HKD entrance, and only 18+ allowed. If you enjoy visiting museums, Hong Kong has no shortage. But one of the best, especially for learning about the history of Hong Kong is the Hong Kong Museum of History. I especially enjoyed the life-sized exhibitions or traditional Hong Kong culture and village life. Address: 100 Chatham Road South, Tsim Sha Tsui East, Kowloon; Opening hours: 10 am – 6 pm on Wednesday – Friday, 10 am – 7 pm on Saturday and Sunday, 10 am – 6 pm on Monday, closed on Tuesdays; Entrance price: Free entrance. 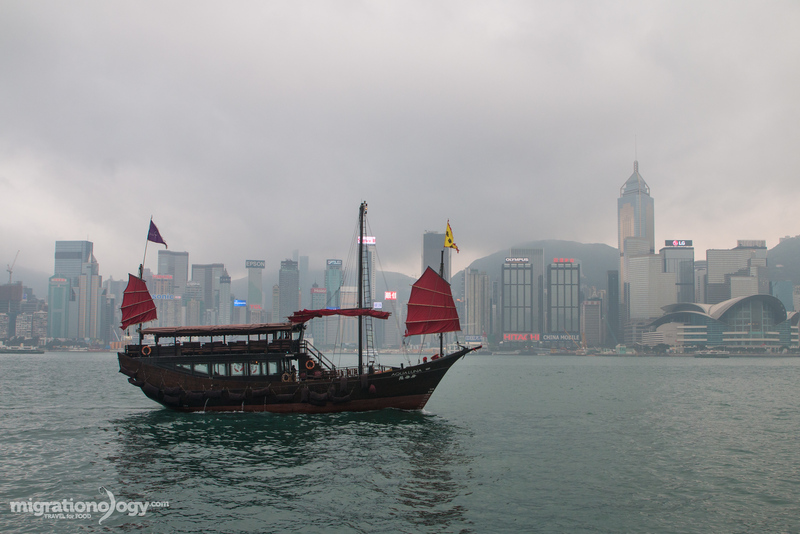 The downtown part of Hong Kong is located on Hong Kong Island and if you cross Victoria Harbor you’ll be in Kowloon. 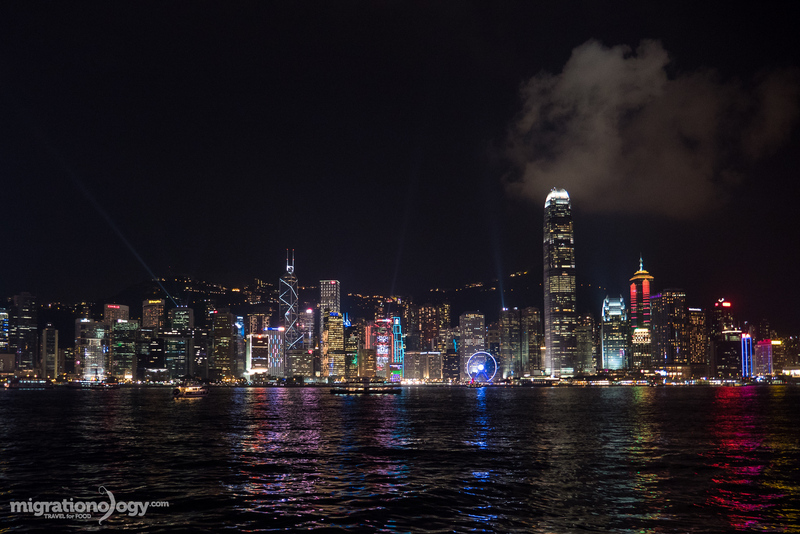 On the edge of Victoria Harbor in Kowloon is the famous Tsim Sha Tsui Promenade, a stretch of harbor edge where you can ingest the spectacle of the Hong Kong Island skyline and walk through the Avenue of the Stars. To capitalize on the magnificent skyline that is Hong Kong, there’s also a light show, which they’ve named A Symphony of Lights. To be honest, compared to the actual skyline itself, the light show is a bit underwhelming and disappointing to me. Nevertheless, I think it’s still worth going just to get out in the evening to walk around and enjoy the atmosphere of Hong Kong at night. Address: Located on the harbor edge of Kowloon; Opening hours: show takes place at 8 pm daily; Entrance price: Free. Home to small businesses, international restaurants, and a world of trade, the Chungking Mansions is a building in Tsim Sha Tsui that just might be the most international melting pot single space on earth. You’ll discover cyber cafes, Pakistani curry restaurants, piles of cell phones, and some budget hostels all crammed into the mansion. When I visited Hong Kong on my first trip back in 2010, my good friend and I stayed at a hostel in the Chungking Mansions, and it was a travel experience I’ll never forget. Since then, the mansions have been cleaned up and safety has improved, but it remains an international destination and one of the most fascinating places listed in this Hong Kong travel guide. Address: 36-44 Nathan Rd, Tsim Sha Tsui, Hong Kong; Opening hours: 24 hours, some businesses 11 am – 9 pm or so. Located on the outskirts of the city, Chi Lin Nunnery is a Buddhist temple designed in a Tang dynasty architectural style. One of the most fascinating things about the temple is that it’s completely made of cypress wood and latched together without using any nails. When you visit the Chi Lin Nunnery, located in the same area is Nan Lian Garden, and impressive Tang dynasty traditional garden. I enjoyed visiting the temple, but really loved walking around the garden and the neatly manicured flora and fauna. Address: 5 Chi Lin Dr, Sheung Yuen Leng, Hong Kong – You can take the MTR to Diamond Hill to get there; Opening hours: Nunnery is open from 9 am – 4.30 pm daily and the gardens is open from 6.30 am – 7 pm daily; Entrance price: Free. Located on Lantau Island, the Ngong Ping 360 is a cable car tramway that literally goes up and over mountains and dangles past harbors of water. You can take the Hong Kong MTR to Tung Chung Station and from there get on the cable car and take it all the way up the mountain to the Big Buddha and Po Lin Monastery. I’ve been on quite a few cable car rides, and so I wasn’t overly excited to go on the Ngong Ping Cable Car. However, I’m glad I went, it was one of the most enjoyable cable car rides I’ve ever been on, providing spectacular views. Address: You can get there from MTR Tung Chung Station, Lantau Island; Opening hours: 10 am – 6 pm on Monday – Friday and 9 am – 6:30 pm on Saturday and Sunday; Entrance price: Round trip ticket costs 255 HKD. In a city as dense and compact as Hong Kong, it’s a great thing the public transportation in the city is well organized, efficient, and functions pretty hassle free. Even when you see a giant crowd at the MTR station during rush hour, they literally have trains running every 30 seconds or so to meet the demand. That being said, while it’s not extremely expensive to take private taxis, which can be a great option sometimes, getting around Hong Kong by MTR, train, or bus is very doable and affordable. MTR – The MTR is the subway / metro of Hong Kong that connects most of the central part of the city, and you can even take it from Hong Kong Island to Kowloon, going underneath Victoria Harbor. The best option for riding the MTR is to buy yourself an Octopus Card at any MRT station for 150 HKD and then you can add more money to it as you go. Ride prices vary between distances, but you can check prices on the MTR website. Train – If you’re taking some day trips, or food trips to the outskirt areas of Hong Kong, taking the train can be a good option. What’s very nice about Hong Kong is that the MTR is connected to the train and you can just keep using your Octopus card if you transfer (so to make life easy buy an Octopus card!). Bus – In addition to the MTR and train, there may come a time when bus in the easiest method of transportation. When my wife and I were navigating around the city and researching for this Hong Kong travel guide, we took the bus quite a few times. The buses are very easy to take, but it’s really only possible if you have access to the internet to research your routes – because there are so many bus routes. Log-on to Google maps, type in your current location and destination address, and you’ll get all the bus options you need. Tramways – Although not the way to travel if you’re in a hurry, if you have time to spare one of the most entertaining methods of transportation on Hong Kong Island are tramways. Rides cost just 2.30 HKD, and run the length of Hong Kong Island. Tramways give Hong Kong some extra character and it’s fun to sit on the top of a tram and take in the sights and sounds of the city. Private taxi – Finally, there’s a never ending supply of Toyota Crowne red and white Hong Kong taxis which you can flag down. Even though Hong Kong can be an expensive city in some ways, private taxis are not unreasonable, and can save some time and energy. Taxis should always use the meter, which starts at 22 HKD and goes up from there. Short rides in Hong Kong will cost 30 – 100 HKD and longer rides can cost 100 – 200 HKD. This taxi fare calculator is handy. The transportation system of Hong Kong is managed and maintained very well, and you won’t have a problem getting around by public transportation. Also, I’d like to mention that if you love to walk, Hong Kong is a great city for walking with sufficient sidewalks, zebra crossings that work, and plenty of hills to get your heart rate up! How much will you spend in Hong Kong? Hong Kong, just like Taipei or Bangkok, are cities that can be as expensive as you want, but at the same time, there are many ways to save and keep to your budget. 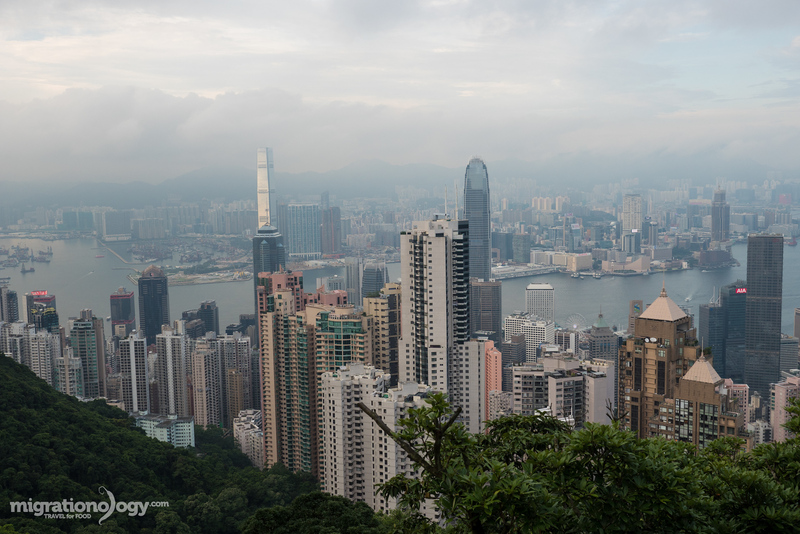 According to Business Insider, Hong Kong is the most expensive city to live in… in the world. But I think that statistic is largely skewed due to the extreme high prices for renting or buying property while living in Hong Kong. So rightfully so, accommodation is probably the biggest expense you’ll have in Hong Kong, but food and transportation can be affordable if you want them to, and there are many free attractions in Hong Kong as well. In this Hong Kong travel guide I’ve broken down a list of typical prices for a few things that I experienced during my trip to Hong Kong just to give you an idea of what you can expect to pay. Private taxi: Rides begin at 22 HKD and go up by distance and time. For short distances on Hong Kong Island you might only pay 30 – 100 HKD, but longer rides might be in the 100 – 200 HKD range. Hong Kong is definitely not a budget destination like much of Southeast Asia, but if you can find accommodation according to your budget, or stay with a friend, your budget for traveling to Hong Kong doesn’t need to be too high. During my most recent trip to Hong Kong I was there for four full days and decided to make a travel video including all restaurants, food, attractions, and everything we did during those all out days of traveling in Hong Kong. Most of the things included in this Hong Kong blog are within these videos. I’v included just about everything, especially the restaurants and attractions listed in this Hong Kong travel guide on the map below, so you can plan our your itinerary and route more efficiently. And here’s the direct link to the map. From the towers that make up the skyline to towers of dim sum, Hong Kong is a city where there’s always something to do and always something delicious to eat. I hope this Hong Kong travel guide for food lovers, along with my other post, 25 dishes to eat in Hong Kong (and restaurants where you can eat them), will help you discover more of Hong Kong on a deeper and more delicious level. Have a great trip to Hong Kong and enjoy the food! 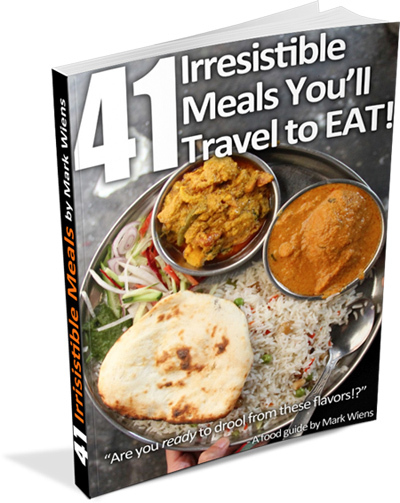 Download this guide on Kindle or PDF! 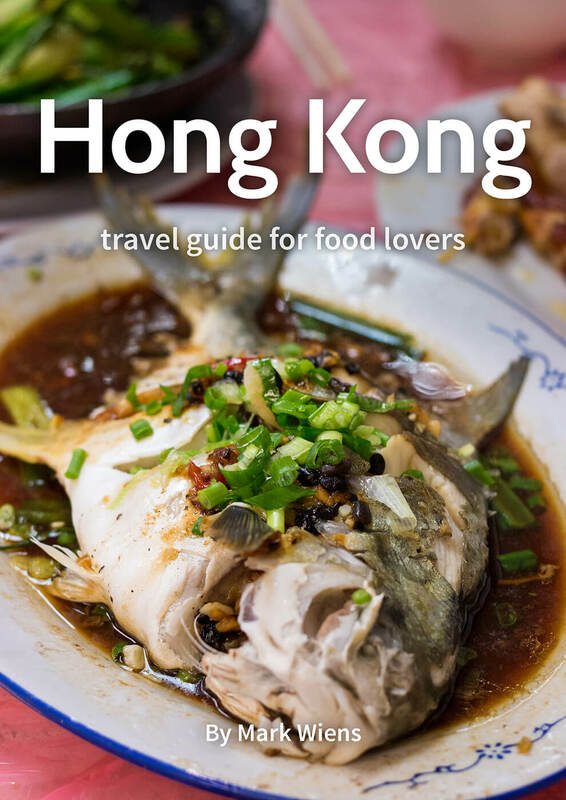 I’ve included this Hong Kong Travel Guide for Food Lovers as well as 25 Dishes To Eat in Hong Kong within this eBook that you can either buy as a Kindle eBook or download as a PDF. Support my work by buying on Amazon Kindle. Click here to download free PDF (it’s free right now, but I’ll be charging for it soon, so make sure you get it now!). However, if you’ve benefitted from this guide, please consider making a quick donation (it costs $4.99 on Amazon).